Ireland’s champion trainer Aidan O’Brien ran four horses in the Jumeirah Dewhurst Stakes, Europe’s top race for two-year-old colts, and saddled the first, second, fourth and 14th. Beethoven, a rare Ballydoyle booking for champion jockey Ryan Moore, scored by a neck at 33-1 from his 20-1 stablemate Fencing Master - both horses are from the first crop of Coolmore Stud stallion Oratorio who was trained at Ballydoyle. O’Brien, who also had the 4/1 chance Steinbeck who finished fourth under stable jockey Johnny Murtagh, said Beethoven’s next outing will be at Santa Anita’s Breeders’ Cup meeting, where he could run in the Juvenile on Pro-Ride or the Juvenile Turf. Moore said: “He travelled very well, picked up nicely and was going away at the end. It’s a bit of a surprise. “To be fair to the horse it was his first time in a visor. He picked up nicely, stayed on and fought hard at the end. “He was always travelling really well. I had him in behind Kevin Manning's horse and he quickened up really well at the end. O’Brien said of Beethoven, who was wearing a first-time visor on his tenth run of the season: “He’s very tough this fellow and he’s progressing all the time. He’s been getting better with every run, even though his form figures don’t suggest it - he’s like his dad [first-season sire Oratorio] who was progressive, progressive, progressive. 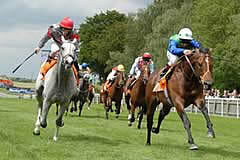 Of once-raced Fencing Master, O’Brien said: “He’s a smart horse. We thought he could run a big race and he’s been working well. Ballydoyle’s strong hand in the juvenile colts’ division includes another Breeders’ Cup candidate, Alfred Nobel, plus St Nicholas Abbey, who is a possible for the Racing Post Trophy and Jameer. Beethoven was quoted at 20-1 for next year’s 2000 Guineas by Paddy Power and 25-1 by Skybet. Champion jockey Ryan Moore picked up a two-day whip ban following his victory on Beethoven in the Jumeirah Dewhurst Stakes. The stewards found the rider had used his whip with excessive frequency and without allowing his mount time to respond. They suspended him on Saturday, 31 October and Sunday, 1 November. Trainer Clive Cox came agonisingly close to landing the biggest win of his career when Xtension finished third, beaten a neck and a nose, in the Group One Jumeirah Dewhurst Stakes. However, Cox was still thrilled with Xtension, his first horse placed in Group One company, and has his eye firmly set on 2010 for the Xaar colt. Cox said: “Obviously we would like to have won, but he has run a great race in defeat and I am very happy. “He has always given the impression that he stays well, and so it has been proved today. “He just takes a while to warm up in his races and he will be better the further he goes. He has not had a rigorous campaign and fills me with excitement for next year. “Next year he will be targeted at the Guineas and I think he may even get further in time. He has a part to play.